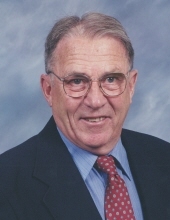 Paul R. Duffy, 92, of Iowa City, passed away Saturday, January 19, 2019 at The Bird House, Hospice Home of Johnson County. A Mass of Christian Burial will be held at 10 AM on Tuesday, January 29, 2019 at St. Patrick Catholic Church with The Very Reverend Rudolph Juarez officiating. Burial will be in St. Joseph’s Cemetery, Iowa City. Visitation will be held from 4-7 PM Monday, January 28, 2019 at Lensing Funeral & Cremation Service, Iowa City, with a rosary recited at 4 PM. In lieu of flowers, memorials may be made to American Heart Association. Paul was born on July 20, 1926 in Iowa City the son of Martin and Fanny (Johnson) Duffy. He was a lifelong resident of Iowa City. Paul graduated from St. Patrick High School in 1944. Following graduation, he enlisted in the U.S. Navy and served during WWII on the U.S.S. Reno and U.S.S. Essex. Paul married Anita Marie Streb on August 5, 1947 at St. Patrick Catholic Church in Iowa City. He started his 42 year career with Sears at the downtown location and helped open the new store at Sycamore Mall. He was a dedicated employee, and was asked several times to assist at store openings in other cities in Iowa. He retired in 1991 and later was one of the honorary ribbon cutters at the opening of the new Sears store in Coral Ridge Mall. Paul was a lifelong member of St. Patrick Catholic Church. He had a respect for wildlife and nature, and enjoyed fishing with his son, sons-in-law and grandsons. Paul enjoyed woodworking and the challenge of fixing things. He could fix any broken thing you gave to him. He enjoyed gardening and watching the birds. Paul especially loved to hear a good joke and was proud of his Irish heritage. Most of all he loved and took care of his family and was always there to lend a hand whenever called upon. Paul is survived by his four children, Rebecca Martel (John) of Coralville, Patricia Michel (Craig) of Iowa City, Martha Kron (Shane) of Iowa City, and William Duffy of Iowa City; ten grandchildren, Denise Schwarting (Arthur), Aaron Nissley (Jennifer), Christopher Michel (Erin), Brigette Price (Nick), Patrick Duffy (Rachel), Megan Duffy-Sherlin (Bailey), Anna Kron, Ian Kron, Samantha Kron, and Noah Kron; thirteen great- grandchildren, Ronni, Seth, Christian, Kendra, Everett, Jaxon, Moses, Luke, Chase, Taylor, Liam, Nolan, Jaimeson; brother, Warren Duffy of Iowa City; in-laws Maribeth Duffy, Dorothy Duffy, and Marvin and Shirley Streb and numerous nieces and nephews. Paul was preceded in death by his parents; wife, Anita; four siblings, Lester Duffy, Alice Jean John, Roy Duffy and Gerald Duffy; and in-laws Gene and Vaida Streb. To send flowers or a remembrance gift to the family of Paul R. Duffy, please visit our Tribute Store. "Email Address" would like to share the life celebration of Paul R. Duffy. Click on the "link" to go to share a favorite memory or leave a condolence message for the family.